Making CEQA Mitigation Less Expensive (and better). • CEQA Mitigations can be a better public benefit if single copies are created to HABS/HAER/HALS guidelines and then donated to Heritage Documentation Programs in Washington DC; costing less and mitigating more. • Most photographic mitigations in California already meet all the required HABS submittal guidelines. • No administrative review of draft HABS documents is necessary when using the informal "direct donation" program. The three programs administered by the Heritage Documentation Programs (HDP) department of the National Park Service (NPS), called the Historic American Buildings Survey (HABS), the Historic American Engineering Record (HAER), and the Historic American Landscapes Survey (HALS), are the gold-standard of documentation policies. The data created for HABS/HAER/HALS must be transferred into the public domain and requires a Life Expectancy of over 500 years (LE500). This is accomplished by keeping the photographic negatives in “state-of-the-art curatorial facilities” at Fort Meade in Maryland which are humidity- and temperature-controlled. After donation to HABS, the data is passed on to the Library of Congress (LoC) Prints & Photographs Division which carries out a series of steps including text-scanning all the documents, scanning of the drawings and film-scanning all the original negatives in high resolution. It's when the documentations are uploaded to the LoC website that they morph from "quality data" to "public benefit"; all the keyword-searchable data, digital Jpegs and high resolution Tiff files of the drawings and photographs are broadcast on the LoC HABS WEBSITE and this public domain data is made available on the Internet for public download 24/7/365 worldwide. Can your local historical society match that? CAN YOUR LOCAL HISTORICAL SOCIETY MATCH THAT?" • Photography & measurements to capture maximum data. • Archival document production and archival materials. • Perpetual storage & perpetual public access. Not just one or two of the basic tenets are required, but all three. After donation to LoC, the archival film, drawings and reports are placed in state-of-the-art cold storage and the data is made available on the LoC website: http://www.loc.gov/pictures/collection/hh/ While it may appear that doing a partial HABS, HABS-Like, Digital-HABS or Modified-HABS documentation using digital photography and/or distributing the artifacts locally would be sufficient, in order for the mitigation to be a public benefit for future generations and meet the SISAED, the entire HABS procedure must be followed. DOES NOT HAVE A MITIGATING EFFECT"
Do you know what bums me out? I photographed Thille Ranch (above), my first HABS-Like project here locally in Ventura, in 2003, and it's unfindable; and I live here; and I took the photos; but I wouldn't know where to start looking. I dread that the negatives all ended up in the planning department's off-site storage in a cargo-container full of file boxes. The majority of the documentations that I get paid thousands of dollars to produce, and that are meant to be a public benefit, are all virtually UNFINDABLE. Yet the ones I produce for HABS/HAER/HALS submittal are all at my fingertips, and will be for my lifetime and many more. Unless you are a professional researcher with inside knowledge of what specific data to request at a specific local historical museum, or you have access to hard-to-access archives like the Huntington Library or the US Navy archives in San Francisco, you will NEVER find the HABS-Like photos I have completed and delivered to local archives. Even then, the historical society may not even know what they have or where they have it. A HAER of the largest lift-span bridge on the West Coast? A famous modernist reservoir roof HALS? HABS of an innovative 1929 Jail in San Francisco? 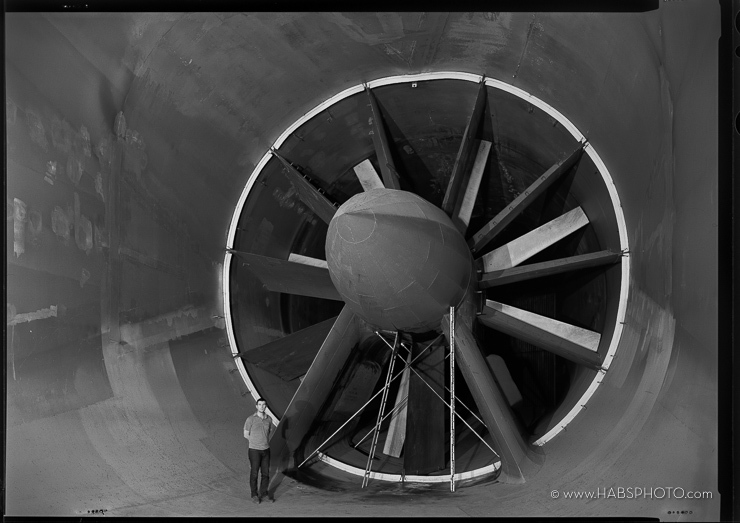 A HAER of the 7'x10' wind tunnel at NASA Ames Research? Power plants, pump houses, and printing presses – nope. Churches, cranes, canals, canneries and colleges – nada. All squirreled away for no mere mortal to find. Not much public benefit there. And the worst part … every single one of those documentations required the same quality and effort as a donation to the Library of Congress; some took even more effort and much more cost. Every. Single. One. Better is Cheaper: Counterintuitively, making only one copy of a HABS/HAER/HALS documentation for the Library of Congress and donating it to Heritage Documentation Programs in Washington DC through their informal donation policy is less expensive than distributing multiple archival copies locally. Note that the "direct donation" procedure to HDP is different than the "mitigation review" procedure for federal Section 106 undertakings administered by the NPS Western Regional Office (more on that later). If a lead agency oversees mitigations for a historic resource under CEQA, then the mitigation should actually result in a public benefit when completed. The act of documentation itself does not have a mitigating effect on the resource. The data recorded and its distribution to the public into the future is the mitigating effect; the more widespread and long term the data distribution, the more meaningful the mitigation. It's the three tenets above: Maximum Data Documentation/Archival Data/Perpetual Accessibility that make a HABS/HAER/HALS survey work, but local documentations usually fall down only on number 3: Accessibility. In our experience CEQA mitigations usually require large format photography and measured drawings that "follow HABS/HAER/HALS guidelines. *" They often expressly require large format film photographs by an experienced photographer and measured drawings by an experienced architect. These mitigations go on to require document production on archival materials "to HABS/HAER/HALS guidelines. *" Then things go haywire, in an attempt to avoid the perceived delay associated with NPS review and perhaps the perceived expense of the getting the data into the LoC, the mitigations spell out the multitude of local historical societies, libraries, archives, info centers and museums that will get copies of the archival prints and sometimes additional sets of master negatives as well. This last rewriting of the guidelines, can be the costliest and yet it also reduces the public benefit of the mitigation. All of the "HABS-Like" large format documentations we produce in California as CEQA mitigations could be repackaged for the LoC and mailed to HDP in Washington DC with little extra effort on our part. These local documentations stay local, aren't scanned, aren't keyword-searchable, aren't available on any website and often just sit on a dusty shelf. All this means they don't really benefit anyone and don't rise to the Secretary of the Interior's Standards; 2 out of 3 is close, but no cigar. Prints for the planning department, local historical conservancies and landmarks commissioners can be produced as acid-free paper laser prints from a color copier for less than $1.00 each and regular 11x17" paper plans can be printed for a fraction of full-sized HABS archival vellum drawings. Once the prints, negatives, drawings and report are donated to HDP and accessioned by LoC, there is no need for the city or local groups to store, protect, insure or backup the data from a HABS survey. The high resolution photographic and drawing files alone take up hundreds of megabytes of space and creating a website to disseminate those images would perpetually need updating, maintenance, and a backup strategy in case of server crashes or viruses. The negatives need to be kept cool and dry and the prints should be available to historians, students and the public. Most local libraries and museums lack the ability to archivally store film negatives for even a generation, and definitely can't compete with Library of Congress life expectancy of over 500 years. If a local citizen wants to access the high resolution files, just type the city name into the Library of Congress HABS search box, HERE, and voila, instant access. FOR THE NEXT TWENTY-PLUS GENERATIONS? What's Stopping You? (Probably NPS review) We want to dispel a couple of myths that have perpetuated in the mitigation world. Myth #1: NPS Heritage Documentation Programs is only interested in National Historic Landmarks and properties on the National Register of Historic Places. Heritage Documentation Programs staff want your local documentations, if it's historic they want it. From the beginning the HABS mandate was to document "A complete resume of the builder's art." The formal 1933 proposal for HABS intended that it cover " … structures of all types, from the smallest utilitarian structures to the largest and most monumental." The myth has a basis in fact; a 1997 memo was circulated by the ACHP that stated that federal documentation will only be carried out on National Historic Landmarks and nationally significant sites to the detriment of the HABS/HAER collections, but a 2017 memo has replaced that limiting policy with an inclusive policy that federal documentations will include ALL historic properties. 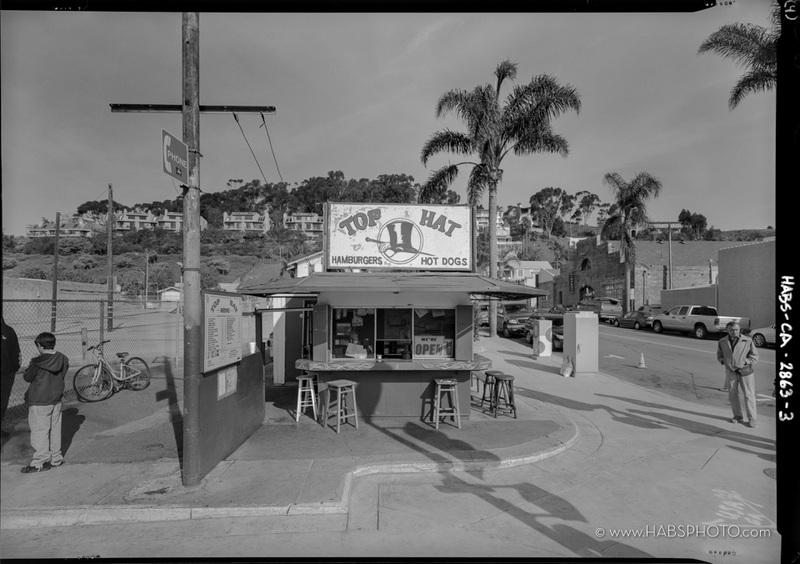 HDP has also been very keen on accepting documentations of resources that are not on the National Register but have local historic significance, buildings as small as a hot dog stand (HABS-CA-2863 below) that would not usually require a federally reviewed mitigation. Myth #2: HABS/HAER/HALS "direct donations" are reviewed for adequacy and require approval by the NPS regional office. Heritage Documentation Programs "direct donations" are not reviewed like federal mitigations. 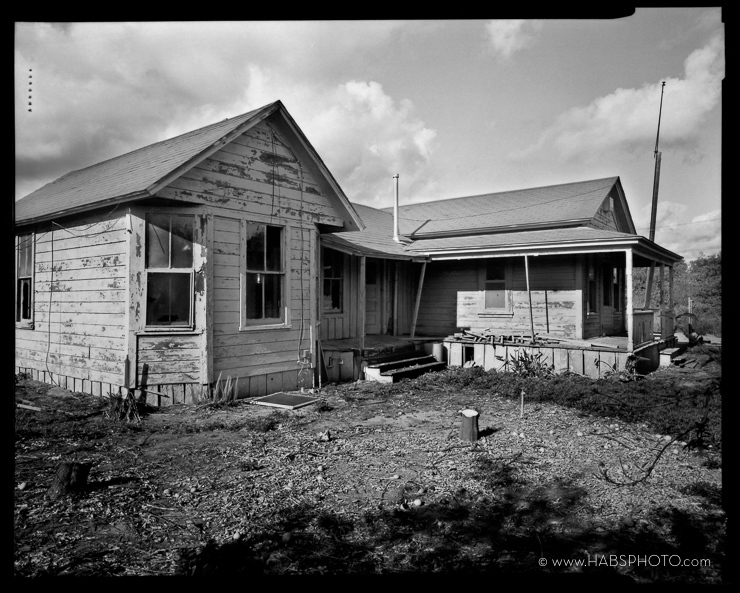 For mitigations under Section 106, the portion of the National Historic Preservation Act, draft HABS mitigations must be reviewed by the NPS Western Regional Office historian in Seattle to assure adequacy of mitigations and recommend changes, edits and sometimes additional documentation. In contrast, "direct donations" to HDP involve a phone call with the HDP collections manager in Washington DC to discuss if the resource is historic, and communication to determine the catalog number and title for the documentation. Most CEQA documentations meet HABS/HAER/HALS formatting and archival guidelines*, and HDP would like to have them in the formal LoC collection, even if it's just one or two photos of a local historical building, this requires one copy of master negatives and one set of archival prints, one copy of any drawings on vellum, and one copy of the report. Myth #3: HABS/HAER/HALS documentation needs to be undertaken with "official" involvement. Heritage Documentation Programs will accept direct donations from anyone willing to follow the stringent guidelines. This can be done by photographers, historians, or developers trying to get a jump on documentation mitigations that they know will be required on a future project. Since there is no better documentation program than HABS/HAER/HALS, having an architectural historian develop a scope and write a report, and having an architect and large format photographer begin the documentation fieldwork can save time, and time is money. If no historian is available to do a full HABS report, a HABS history-short-form can be filled out by anyone with access to basic historic information about the resource. Obviously, an experienced photographer or architect knows the expectations of the collections manager at HDP, (an important donation may not be the best place to try out your uncle with a camera). The best time to document a historic resource was right after it was built, the second best time is today; waiting for a "more convenient time" sometime in the unknown future when the documentation is a contractually required mitigation, is tied to project approval milestones, and needs to be signed off by the city planner will not produce a better archival document, just more emails and bigger headaches. We have done a number of HABS donations where "getting-it-over-with" was our client's main goal, but they saved time and money and made for a better public benefit documentation to boot. Win-Win. We have created an EXAMPLE OF MITIGATION Whitepaper to show documentation requirements for some CEQA environmental documents like MNDs and EIRs. These mitigations can also be used as a basis for creating NEPA and Section 106 mitigations to federal undertakings, but consultation with the State Historic Preservation Officer (SHPO) will be required to determine the exact deliverables and required scope.